Jim Berenholtz is a composer of music for theatre, dance, film and the concert stage. He is best known for his work bridging the classical and contemporary musical styles of the Western world with the indigenous sounds of ancient and native cultures. Among his many compositions are “Buffalo Nation”, a Native American-themed opera, “Luna”, an astrological ballet, and “Songs of Forgotten Relatives”, a musical play about the disappearing diversity of cultures and lifeforms. 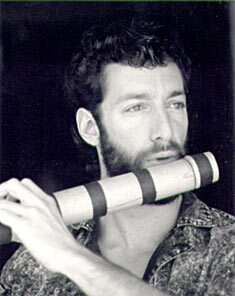 Mr. Berenholtz graduated Amherst College in 1979 with a degree in composition and ethnomusicology. In 1984 he co-founded the musical duo Xochimoki, which soon became a leading force in the revival of the ancient musical traditions of the Aztec, Maya, and other pre-Columbian civilizations. Through Xochimoki he went on to become a performer with the Los Angeles Music Center On Tour and the Orange County Performing Arts Center in-the-schools program. He has also performed at peace conferences and sacred sites throughout the world, including Machu Picchu, Peru, the Pyramids of Giza in Egypt, the University of Peace in Costa Rica, and the Peace Museums in Hiroshima and Nagaski, Japan. Mr. Berenholtz is a member of the American Composers Alliance, and a former grant recipient of the American Music Center. His original works have been played by the Great Falls Symphony in Montana, and the Diablo Symphony and San Jose Chamber Orchestra in California. He has produced eight recordings on cassette, both solo and collaborative. He has also scored music for feature films such as “Lords of the Deep”, and collaborated on the Emmy-nominated soundtrack for TNT’s “Geronimo”. He recently completed recording a new double CD at Skywalker Sound, near his home in San Francisco. The CD is entitled "The Psalms of RA", and sets ancient Egyptian, Sumerian and Hebrew texts to his original music, conveying a universal musical language of light.